As winter provides its deepest chills, most surface activity fades. Food items for trout become almost strictly subsurface and the size of those offerings in the drift typically decreases. 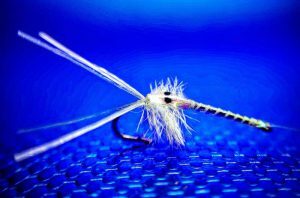 There are currently a plethora of subsurface patterns available in the world of fly fishing for trout. This list is not intended to look down on or exclude any in particular. It is however, made up of patterns that have consistently brought fish-to-net during the winter months and beyond. 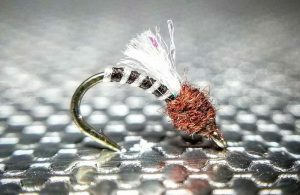 The Top Secret Midge is Pat’s go to small midge for tough trout. The slim profile, realistic segmented body and emerging wing produce a life-like midge emerger. 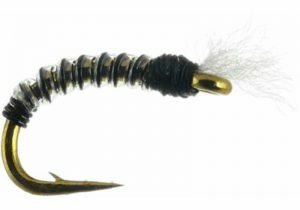 It is tied on a Tiemco 2488 which increases its hook-ability especially in small sizes. He ties the Top Secret down to a size 26 and it’s my go-to bug in the winter months. The Glamour Madeira wing adds a dash of flash which attracts nearby fish. 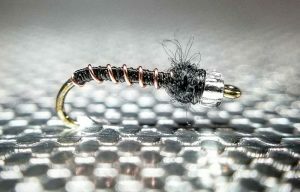 Landon designed the Mayer’s Mini Leech to match the small freshwater leeches that trout feed on in freestone rivers, tail waters, and still waters. With the micro pine squirrel attached only near the eye of the hook, the extending material will constantly move in addition to the ostrich herl collar. 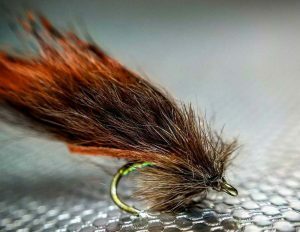 This fly is also versatile in different disciplines; you can dead drift it as a nymph, swing it as a nymph, trail it behind a larger streamer using a strip retrieve. Dunnigan’s Clear Water Emerger was designed for the spring and fall transitional phases from baetis to midges and vice versa. With that in mind, the glass bead on this fly was designed to cover the other transitional phase of emergence in both mayflies and midges. This fly is tied in a size range of 18-22. Casey most commonly fishes the size 22 as midges are very small and that broadens the chances of catching more fish. It is a very effective pattern throughout the year. The Mercury Black Beauty is a variation of Pat’s original Black Beauty that surfaced in the early 1990’s. The Mercury version incorporates a glass bead that simulates the gas bubble affect in emerging midges. The bead becomes a trigger and entices fish to eat it as a result of the luster in the thorax area, which imitates the trapped air in the thorax. It fishes well in a wide range of sizes from size 18-24. Tied on the red shank of the Daiichi 1273, the Demon Midge radiates the red coloration seen in many midge larvae. The ingredients of this pattern create a very slim profile that accurately imitates the natural. In addition to this, fine segmentation and a small touch of flash create the complete package for fooling selective trout. Gunkel’s Radiation Baetis has continued to fool fish on the heavily pressured tail waters of Colorado since it’s creation several years ago. This sleek pattern displays an ideally slim profile. The addition of translucence with a little flash results in a highly durable and effective pattern. 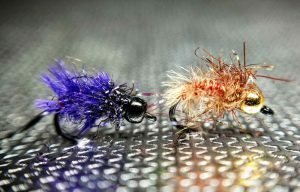 The Mayer’s Mysis #14-18 (Umpqua Flies) was designed to imitate the natural look of a mysis shrimp that is alive and semitransparent. The tinsel filled body reflects light and color like a natural shrimp. In addition to the rubber leg antennae and ostrich collar, the imitation moves and breathes like a darting mysis. 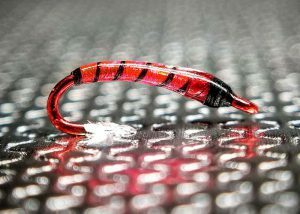 The Neon Nightmare was created as a changeup pattern for Matt’s home based guide water. The fish in these waters are relentlessly presented with a plethora of midge larvae patterns. 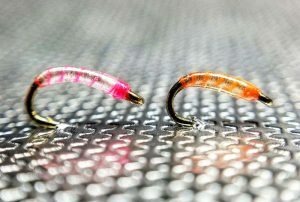 The highly transparent nature of this pattern along with it’s hot spot touch, have proven highly effective in connecting with these weary trout. When you see midges in the water or pull them out of the sein they typically have the appearance that the majority of the insect is incased in a clear ribbed body. I tried to match this effect in my Tube Midge with Ultra Wire inserted into clear tubing before wrapping it on the #18/20/22 JB01 hook shank. 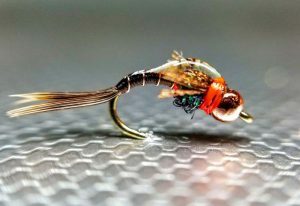 Not only does it give the midge a clear natural appearance, the fly is also incredibly durable performing well on more than one fish. 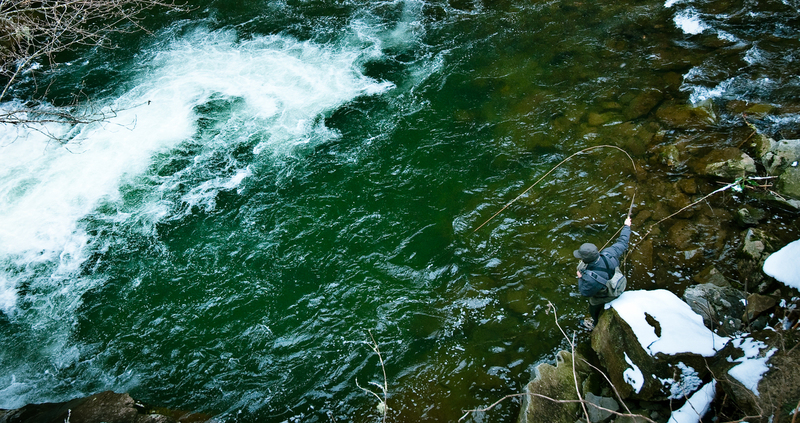 Created as a general imitation, the Fusion has consistently fooled trout around the world in all water types. It’s combination of supple movement, flash and significant weight; result in a fly that enters the strike zone quickly and triggers takes. For the depths of winter, size 18 in red and purple consistently produces fish. 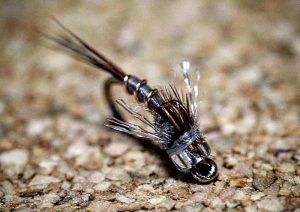 This entry was posted in Fly Tying, The Hot Ticket, Trout Fishing and tagged 10 Successful Subsurface Flies for the Dead of Winter, 10 Successful Subsurface Trout Flies for the Dead of Winter by Louis Cahill. Bookmark the permalink. Always nice to get some new patterns for winter. Thanks for the great articles especially the winter specific ones! You’re welcome Michael. I’m glad it helped. I bet a red hook with a ball of black thread tied near the eye would work. Not very impressive to the fisherman, but a fish on the line is a fish on the line, am I right? As long as the fish approve, you’re good to go! Thanks for another great post! Quick question for you. The photo (above) next to the Shea Gunkel Radiation Baetis appears to be a different fly.. or at least different than the one in your very helpful video. Do you by chance have any information on the fly in the photo? I would love to learn more about it. It appears it would be deadly on the swing with that emerging bubble of resign. Thanks!